EPS Review #49 - Tigrero! "Ha! Is this for real?" asked Patricia, when she looked at the cover depicting a jaguar and a serious-faced "man who fights giant man-killing jungle cats, armed only with a spear." The spear looks mighty sharp. Siemel was born in Latvia. His brother Ernst ran away to join the Argentinean navy, and Sasha followed on a freighter a few years afterwards. The book opens as they reunite in a town in the Matto Grosso of Brazil. They both have jobs as metalworkers, and make enemies with a small man named Favelle. Sasha boxes with an itinerant professional wrestler and wins, sending Favelle, who has bet against him, into a fury. Sasha clonks Favelle on the head, and thinks he has killed him. The local strong man gives Sasha and Ernst the night to try to get away before he goes after them with dogs and adds their ears to his collection on a string. Sasha and Ernst make for the diamond fields in the north. There they nearly get shot because they make friends with a naive American man from Springfield with a diving suit -- the other miners suspect him of stealing their diamonds underwater. All this time Sasha wants to head into the jungle, to find the native "tigre" hunter Joaquim Guato. Which he does, and spends time as his disciple, learning to watch the tigre's feet, and to kick mud in its face to cause it to spring. Then, you catch your 350-pound animal on the end of the long spear, and dance around it, driving and twisting the spear without letting the tigre get you with his claws. But Ernst is bored in the jungle, and marries the first farm girl they see. Later some thug from the diamond fields kills him to revenge some slight. Sasha finally meets up with Favelle, who did not die, but was roaming about, also looking for revenge. They circle each other on the dock, and Favelle falls into the river, only to have piranhas rip out his stomach. He makes it to shore, staggers to his hut, and blows his own brains out. Sasha spends more time killing jaguars, but feels increasingly lonely. A rancher asks him to kill a particularly difficult animal, but Sasha refuses, fearing for his dogs. So the farmer goes off, and his wife visits next -- you can imagine what happened to her husband. Sasha hunts down the jaguar, at the expense of his last good dogs, though a young foolish one saves his life. On a lecture trip to Philadelphia, Sasha, well over 40 now, is spotted and tracked by a 19 year old girl. 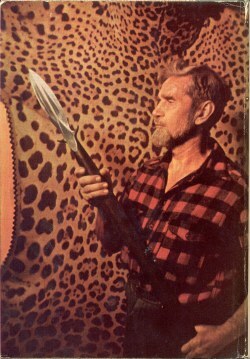 She snares him in the end: on my bookshelf I also have Jungle Wife , by Edith Siemel (with a signature by Sasha!). I see on ABE, that this book was followed by Sashino about how their 14-year-old son learns to hunt. There is a biography as well. At one point he must have been quite a famous guide -- there is a picture of Theodore Roosevelt Jr. in the second book. Tigrero! has dust cover blurbs by two other once-famous but now largely forgotten (but not by me!) explorers: Peter Freuchen , who married an eskimo, and Roy Chapman Andrews , who hunted dinosaurs. Stephen wrote: God! But is it for real?